Spring is here. Let’s talk Solar! Solar Electricity, As Sure as the Sun Will Rise. Learn how to take Full Advantage of the Sun. The power plant in the sky, which we call the sun, offers the Earth enough energy to fulfill all the world’s power needs many times over. It doesn’t give off carbon dioxide emissions. It won’t run out. And it’s free. 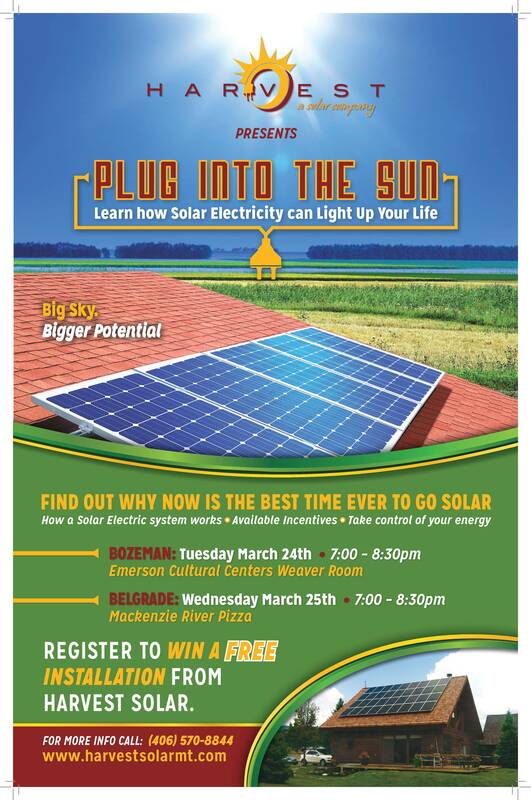 Harvest Solar will be hosting the “Plug Into the Sun Community Event” Tuesday March 24th at the Emerson Cultural Centers Weaver Room from 7:00– 8:30 pm and Wednesday March 25th at Mackenzie River Pizza in Belgrade from 7:00- 8:30 pm. Community members will learn how solar electric systems work, how to benefit from available incentives and why now is the best time ever to choose this technology. Receiving as many solar producing hours per day as Florida, The Sunshine State, Southwest Montana and our big sky is a prime location to harness the power of the sun and put it to work for you. As power rates increase and the country makes moves to reduce our dependence on fossil fuels to produce our energy, many are left wondering how they can take hold of their own electrical generation. Choosing solar electricity allows homeowners and business owners alike to protect themselves from these uncertainties and lock in their power rates for 20 or more years. The “Plug Into the Sun Community Event” is designed to help Montanans learn how this technology works and how they can easily and affordably make it a part of their own lives. Over the course of the past five years the price of solar electric panels have steadily decreased and the solar electric industry has grown which has made solar affordable and attainable. Attendees will learn the about the components of a solar electric system, how net-metering works, what goes into an installation and how to benefit from federal and state incentives. Everyone who attends the “Plug Into the Sun Community Event” will have the opportunity schedule a free site assessment as well as enter to win a free installation from Harvest Solar. For more information feel free to contact us.